Hong Kong is known for its many outstanding restaurants. As I, like many of your, prepare to return to my studies, one of the things that I’m most looking forward to is all of the great restaurants that I will be able to enjoy once I’m back in Hong Kong. 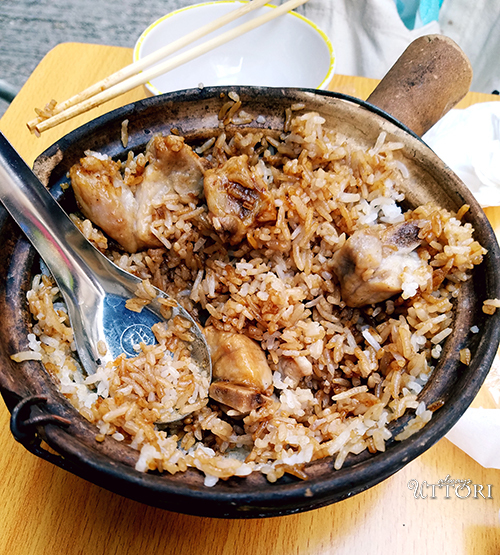 The best way to eat in Hong Kong is by district, so, similar to our first Hong Kong food guide, this part two guide to Hong Kong food spots covers good eats by district, specifically in Central, Causeway Bay and Yau Ma Tei. So, whether you are planning a trip to Hong Kong, or traveling vicariously, I hope you enjoy Eating Hong Kong 2: Good Eats, and what I hope will be a continuing series. On a side note, eating in Hong Kong is really cheap. The meals I share below were all eaten in one day (shared with a friend) and it only cost $30 USD (US Dollar) each, or $242 HKD (Hong Kong Dollar). With prices like that, Hong Kong is the perfect place for foodies in search of delicious, authentic food. Central is called central for a reason, it’s the main hub of Hong Kong business. Being a business hub means there’s also a lot do, eat, and see in this area. There are so many food and entertainment options here, it’s unlikely you can get to all the amazing restaurants in one trip. Here are a few of the places I ate that were worth the stop. Urban Bakery Works is a café inspired by London’s Borough market. They serve breakfast, lunch, afternoon tea, and happy hour. 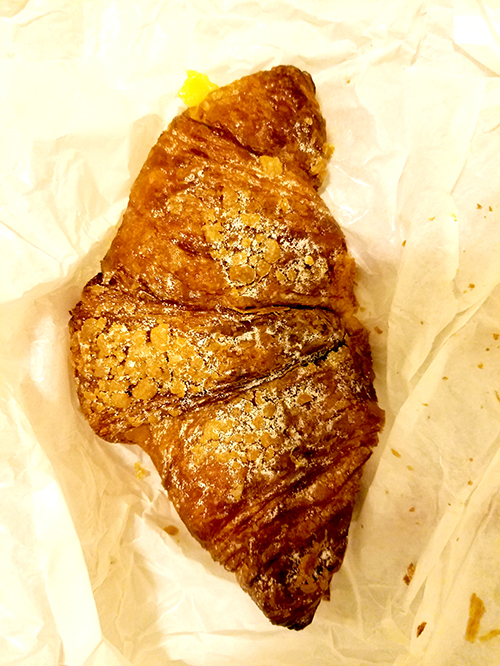 We came to this bakery for the Molten Egg Yolk Custard Croissant, which was amazing. Both sweet and salty, the egg custard was gooey and buttery, definitely worth a stop, especially if you are already shopping at the famous Landmark shopping center. Well known for their traditional wonton noodles, Mak’s is located on the side of a bustling street, in-between dozens of other food options, so it’s easy to miss. Resist temptation as Mak’s is well-worth the wait. I got the Shrimp Wonton Noodle with soup and it was my favorite meal of the day, especially since I was battling a cold at the time. The broth is clean and flavorful, the noodles perfectly cooked with a good chew. So, so, yummy! Tai Cheong Bakery has been around since 1954. 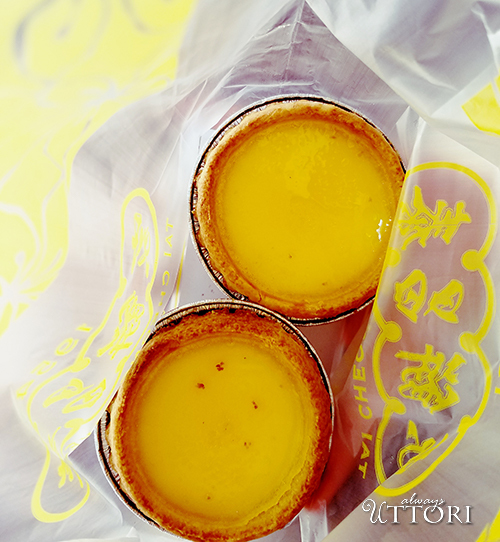 They are said to have the best egg tarts in Hong Kong. Although it wasn’t the best egg tart I’ve ever had, it was well worth a visit to try the other traditional Cantonese baked goods the bakery offers like pineapple buns and steamed rice cake. Lan Fong Yuen wasn’t on our list of places to try, but wandering around (lost), in search of our next spot, we came across this restaurant and couldn’t resist getting an iced lemon tea in an effort to beat the Hong Kong heat. 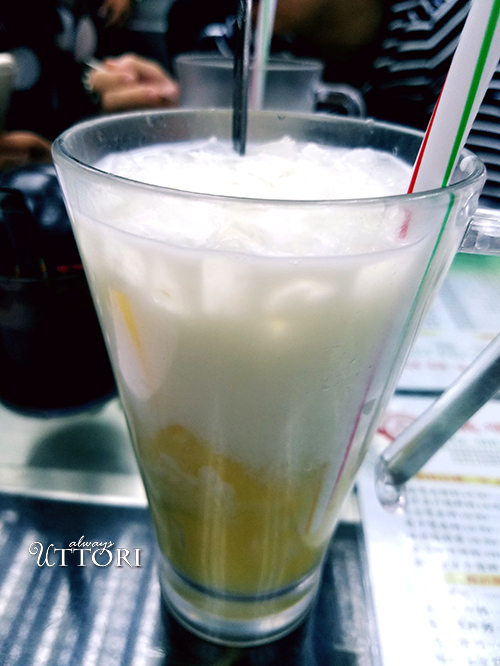 Lan Fong Yuen is a famous tea café, credited with inventing milk tea. There were a lot of people waiting outside for their drink orders, and getting pictures in front of the shop, but you can also sit down and eat full meals. 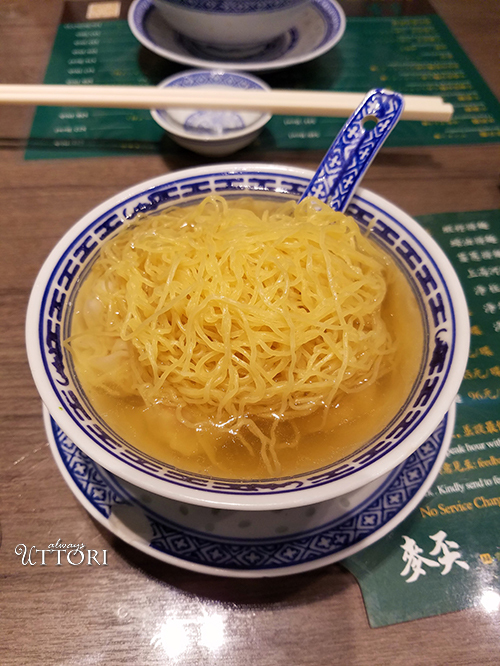 Since the restaurant wasn’t originally on our list, I definitely plan to go back and try some of their signature dishes, like pork buns and instant noodles, as well as their milk tea. Causeway Bay, also known as Tung Lo Wan in Cantonese, is one of the biggest shopping districts in Hong Kong. Its retail rental costs rival that of New York City. Speaking of New York, Causeway Bay has its own Times Square, a 9 story shopping mall, and two office buildings. Sometimes getting lost is a good thing. 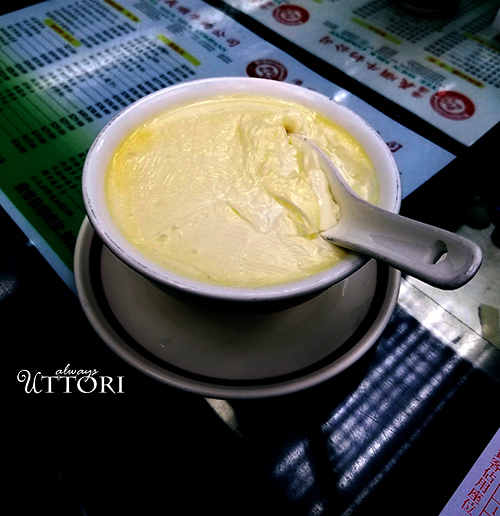 As with Lan Fong Yuen, our stop at Three Dice Kitchen was pure luck. 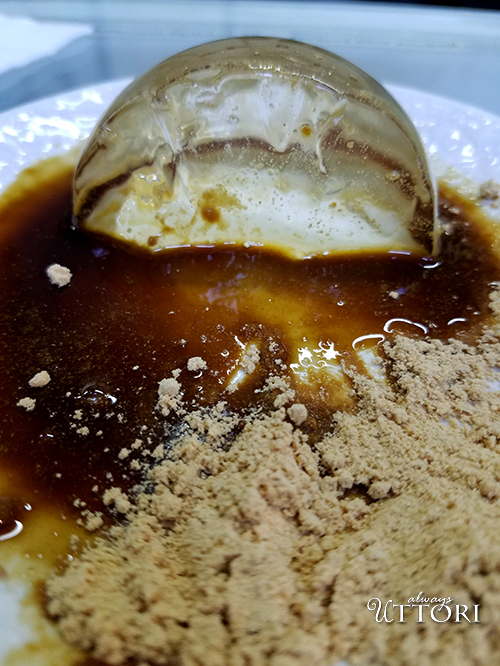 If you’ve heard about raindrop cakes, or water cakes, which were an internet sensation a couple of year ago, this is the place to try them. Raindrop cakes are clear, molecular gastronomy style cakes. The cakes are flavorless, but you can select from a variety of toppings that provide all the flavor. It wasn’t the best thing I’ve ever eaten, but the standup bar experience, and finally getting to eat an Instagram famous cake made it a fun and interesting experience. I chose the original flavor, which is served with a sweet molasses like syrup and soybean flour, while my friend got mint chocolate chip. My recommendation is to stick with the original flavor as the syrup and powered stick to the cake better than chocolate. 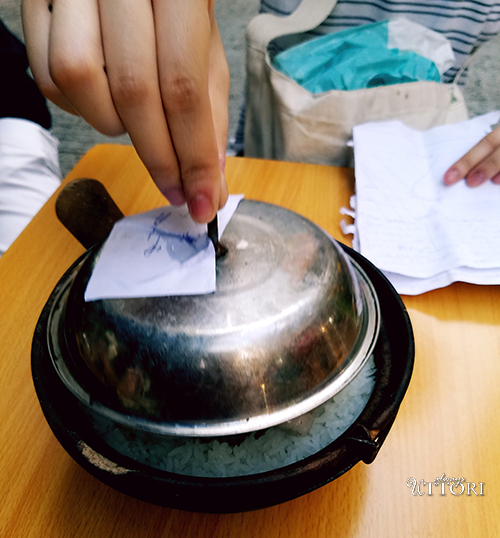 Also, if it’s your first time trying a raindrop cake, why not try it the original way it was intended to be eaten? 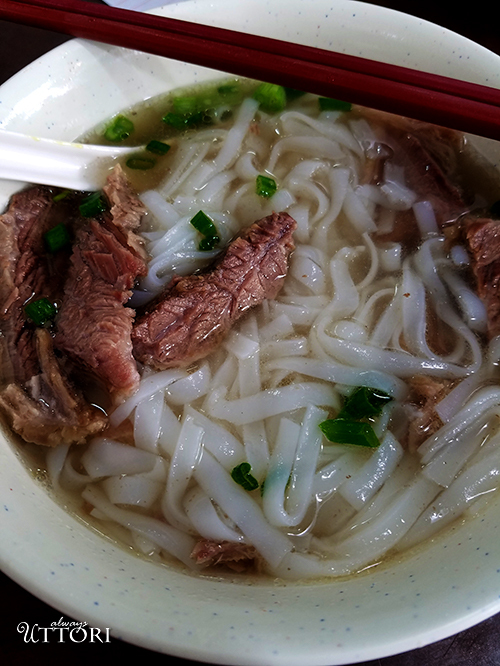 Sister Wah is known for their beef brisket soup. And while it’s in Causeway Bay, it’s also a bit of a trek. If you are planning on visiting Victoria park, the restaurant is not too far from there. This place gives you a real taste of local life as families and students frequent the restaurant. I also enjoyed watching a man make and divide noodles at a little table in the corner of the shop. How’s that for fresh? The beef brisket was tender and chewy, and the soup, delicious. Unfortunately, I was feeling pretty full at this point, so it wasn’t as appetizing as it might have been had I eaten it earlier in the day. Milk as dessert may be a foreign concept to those not familiar with Asian cuisine, but in fact, milk flavors many candies and breads. Yee Shun Milk Company is actually from Macau, but has several branches in Hong Kong. From milk drinks to various kinds of steamed milk, this stop isn’t to be missed. We had a pineapple milk and a steamed milk. The pineapple milk was pineapple juice and chunks of pineapple, topped with milk, simple, but surprisingly delicious. 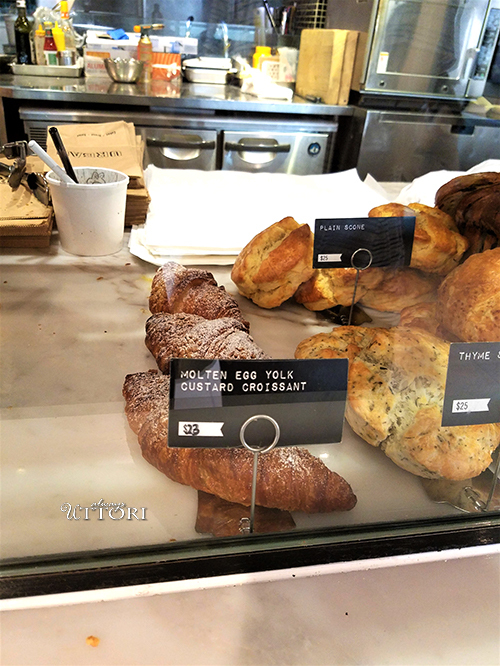 The steamed milk is unlike anything I’ve had before, lightly sweet, warm, and not quite as thick as a custard or pudding, it’s more like a just set mousse, only warm. 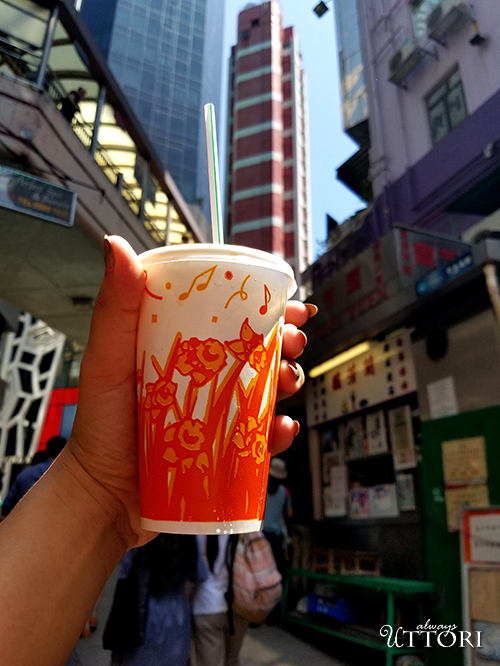 On the Kowloon Peninsula, Yau Ma Tei is a nightlife hot spot serving customer from the many night markets that pop up after dark. When you’ve finished eating, you can work off the food by strolling around the night market and picking up souvenirs for friends and family. This is a place that was supposed to be on the last food guide I did, but the first time we went, they were just starting to get ready for dinner. They open at 5:30 pm and stay open late into the night. If you get there at the right time, the place is totally transformed with so many customers, the tables spill out into the road. The restaurant is on Temple street, so after you’re done eating, you can check out the famous Temple Street night market, which begins just a few feet away from the restaurant. Hing Kee is all about the clay pot. 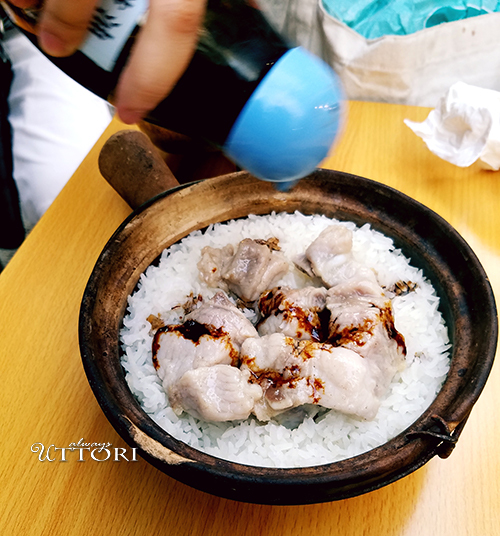 Rice, topped with your choice of meat steamed in a clay pot, make for the most delicious steamed rice I’ve ever tasted, with crispy and chewy pieces at the bottom. Not only is the food good, the atmosphere isn’t to be missed.